The initial menu, which I saw on the screen, was from Unetbootin. It had the usual options, like to boot Zorin OS 6 Live system, Live with simple graphics, go directly to installation, check memory and boot from HDD. My choice was for Live system run. Boot time for Zorin OS 6 Core was rather quick. I'd say that it was faster than Ubuntu itself. There were no additional questions during the boot. The splash screen of Zorin OS has the blue-themed image with Zorin OS logo and two rotating circles. In other words, nothing’s different in Core compared to Lite at this stage. Once booted, I saw the desktop with a panel at the bottom. There were 4 icons on the desktop: Computer, Home, Trash and Install Zorin OS. The wallpaper is in a deep-blue tone, with stripes across the screen. It's the same one I saw on the splash screen. Whereas Zorin OS 6 Lite comes without any additional wallpapers, the Core version includes a choice from about 2 dozen of alternative images. Some of them are Zorin specific. Apart from the choice of wallpapers, the Appearance section of System Settings panel offers you a choice of themes. They are more or less Ubuntu-standard: Ambiance, Radiance and two high-contrast ones. What I have noticed is that the default Zorin OS theme is not listed amongst the Ubuntu themes. It means you can't revert back to it once you start playing with your desktop theme. At least, not using the standard configuration application. The panel is at the bottom of the screen. The design of the panel is quite unusual. There are 3 visual sections in it. Curves separate the middle part from the left and right parts of the panel. The middle part also has a different color and opacity. The left part only has one element in it: the Zorin OS menu, GnoMenu. The right part has a set of the usual suspects: power, clocks, communication centre status, volume control, power meter and network indicator. The system clock was set to UTC - 5 hours, so I was automatically "moved" from London to New York. The middle part of the panel is the taskbar. It has the Windows 7 style in the default Zorin OS 6 Core distribution, where each application only has the icon without any text beneath. You can easily "pin" applications directly from the panel. The right-click menu, apart from the "pin" function, has application-specific items, like in Ubuntu's Launcher. The default distribution only has 3 items "pinned" in the taskbar: Google Chrome, Nautilus file manager, and Rhythmbox media player. What you will probably have noticed already is that two usual elements are missing from the pane in Zorin OS 6 Core: “Show desktop” icon and a virtual desktop switcher. The second missing element can be explained by the fact that Zorin OS is targeted to ex-Windows users who can be confused by the concept of a multi-desktop environment. Although, the absence of “Show Desktop” icon is definitely a miss. There are lots of desktop effects available from the very start. Windows maximize and minimize, appear and close with visual effects. It may be OK for some, but I can do with less of those effects. The freshly booted system uses about 290 Mb of memory. There were no issues with the wireless network card Intel 3945 ABG in Zorin OS 6 Core. Everything was recognized and configured automatically. I only had to select my home network from the list of available ones, and type in the security key. GnoMenu is the menu in the Zorin OS. It is in the Windows 7 style, where applications and their groups are shown in the left column, and some technical items like folders, System Settings, etc, are in the right column. I'd say that it is somehow similar to the famous Mint menu, although GnoMenu is less tangled, from my point of view. An issue, which I noticed from the very beginning, is that application groups and applications themselves are not distinguished from each other in the menu. For example, the item called “Wine”: is it a group or an application? The correct answer is below. What is in the menu, anyway? Google Chrome is the only browser in the Zorin OS. Apart from Chrome, there is a Zorin Browser Manager tool, which gives you an option to install Firefox, Midori and Opera. Honestly, I am happy with the default option here: Chrome has been my favorite for a long time. Thunderbird, Gwibbler and Empathy are other communication tools in Zorin OS 6. They are also grouped together into the communication status icon at the bottom right part of the panel, which I mentioned before. The same icon also gives you the access to Ubuntu One cloud storage, which is not accessible via GnoMenu. Remmina remote desktop and Desktop Sharing tools finish the list of the Internet section. LibreOffice is the core part of the Office part of the Zorin OS 6 Core menu. There are standard LibreOffice tools like Calc, Presenter and Writer, plus Draw. You can also find Document Viewer and Dictionary in the Office part of the menu. There are about half a dozen simple games in the Zorin OS: Mines, Mahjongg, two Solitaires, and so on. The Sound and Video section of the menu is well stocked. You can find VLC, Movie Player and Rhythmbox there. There is also Brasero disk burning tool, OpenShot video editor, Sound recorder and Webcam booth. There is a separate menu section called “Wine”, as I noted before. It actually lists several items, for both Wine and PlayOnLinux: install and uninstall applications, browse disk C: and so on. The Graphics section of the Zorin OS 6 Core menu includes GIMP 2.8, Shotwell photo manager, Image Viewer, Simple Scan and the same Document Viewer and LibreOffice Draw, which I have mentioned earlier. The System Tools part of the menu includes several standard applications, like Disk usage analyzer, System Monitor, System Settings and so on. Zorin Look Changer is also in the same section of the menu. Unfortunately, it does not work in a Live session, and requires the system to be installed. In the System Settings, I'd like to point out that Zorin OS comes with a firewall installed, although it is inactive in the default system. Ndiswrapper, the tool to install Windows drivers for hardware, is also available in Zorin OS 6 by default. As you can see, Zorin OS comes well-equipped with applications in different areas. If you don't see something in the default distribution, then you probably need to install it from the repository. This is not a problem, since Zorin OS is based on Ubuntu. Hence, all the Ubuntu repositories are at your fingertips. Both Synaptic and Ubuntu Software Centre are available by default. The distribution's repository list includes all of Canonical's repositories, plus many PPAs for non-standard software. There is a shortcut to System Settings panel in the right part of the GnoMenu. One of panel’s items is Keyboard Layouts. This configuration utility is in Ubuntu style, and it was not a hard task for me to switch from the default English US layout to the set of English UK plus Russian with Ctrl-Shift as a switch hotkey. Zorin OS 6 Core had no issues with scrolling and tapping on the touchpad. Nautilus file manager in Zorin OS 6 Core has an option to browse the network. Unfortunately, it did not work for me. The system could not see the fileserver in my home network. At the same time, Zorin OS 6 Core distribution does not include smbfs package, necessary for manual mounting of remote Samba/Windows network partitions. The problem was not solved by installing the above-mentioned smbfs. This time, I found another issue with Zorin OS 6: it did not recognize the DNS records for devices within the local network. Although I could ping external servers like google.com and darkduck.com, the local file server fnd was an "unknown host" for the system. 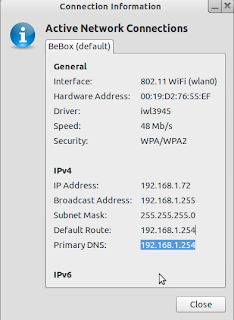 Network Details showed the correct details for my wireless router, but the system still could not connect. I have exactly the same configuration in my Xubuntu installation, where I can access local devices easily. I could not connect to remote partitions even with IP address of the remote file server in sudo mount command: "Unable to find suitable address" was the system response. That's why I can't tell you if Zorin OS 6 Core works well with the remote partitions. The presence of VLC in the Sound & Video part of the menu removes all doubts about the ability of Zorin OS to play multimedia files. Yes, Zorin OS gives you all the multimedia features you need. Flash Player is available too, and playback of YouTube videos was not a problem at all. 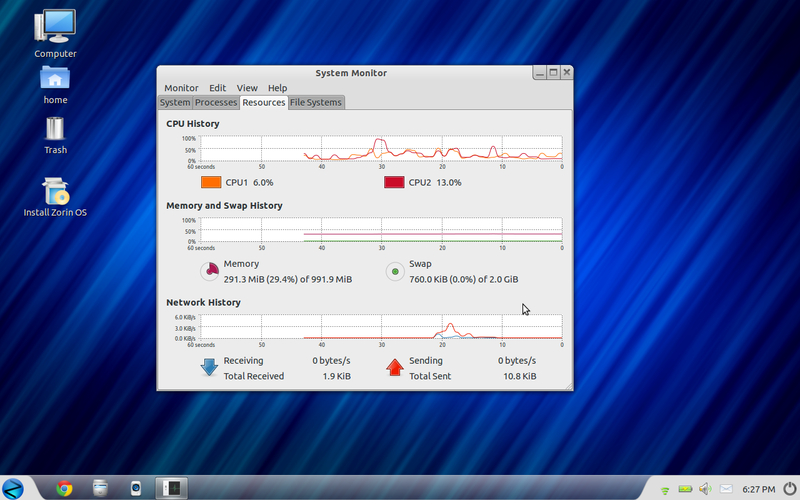 There were both positive and negative moments while using Zorin OS 6 Core, which I will highlight here. To start with the positive ones, the system was absolutely stable and reliable. I had no issues with crashes during my Live run. The system was extremely snappy when running from the Live USB. Even the usage of visual effects did not impact the performance. Running Zorin OS 6 with several Google Chrome tabs, YouTube, GIMP, LibreOffice Writer and a couple of minor applications at the same time? On one 1Gb of memory and a dual-core Centrino 1.7 GHz processor? Not a problem at all! The system just zipped along! I did not expect this from Ubuntu-based system with GNOME3-based interface. I would even say that Zorin OS 6 feels snappier than Xubuntu on the same laptop. But Xubuntu runs from HDD! Wow! At the same time, I was disappointed by the network issue I described above. The DNS resolution problem for local devices is not something I'd expect. Also, there are some dubious decisions in the user interface, for example the missing Show Desktop button or the absence of an option to restore the Zorin theme. But these are minor issues, aren’t they? All in all, I think Zorin OS is a very decent system. If you dislike both Unity and GNOME3, but like the abundance of applications in the Ubuntu repository, then why not look at a solution provided by Zorin team? You can easily download Zorin OS 6 Core here, or order a CD with this distribution from Buy Linux CDs site. What's next? Apart from the Core version of Zorin OS 6 operating system, there is an Ultimate edition of this distribution. It is not "free as in beer", you need to pay for it. I got a chance to peek at this version of Zorin OS 6, too. Up until this weekend I have been happily running Zorin 5. I think Zorin is really really good. I like all the little effects. Unfortunately I messed up my installation at the weekend. I had two partitions 1 for Zorin and 1 for Mint. I accidentally deleted files off the Mint partition which I wasn't using anyway so I thought I'll clear that partition and just have one big Zorin one. My knowledge of partitioning is basic and something I really need to work on because I managed to destroy the Zorin partition as well. Needless to say my pen drive that had Zorin on it now had Mageia 2 on it as I was planning to give that a go next and so I ended up installing Mageia 2 with KDE Plasma. I'm always one step behind you Dark Duck. You review Zorin and I'm on Mint, You review Mageia and I'm on Zorin. You review Zorin again and I'm on Mageia. First impressions of Mageia. Very good. Not one issue to report. Took me a little while to work out how to get all the repositories but then it was plain sailing from there. you don't need a hdd to install linux! if you have a laptop take out the hdd -it takes 1 min- and put a stick in the usb connection. now you can install and use your linux. you can find very good sticks of 16 gb between 8 and 14 euro. you can forget the thing with unetbotin! Thanks for the hint. But trying Linux distros is not the only thing I do on that laptop. And I am not the only user of the laptop. That's not an English mentality, that's a human nature. They pay me money in the UK, but I have other ways to spend it rather than to a yet another laptop. In Britain they pay us with buttons, tax us in pounds, give it to the bankers who then take the shirt off your back so you have no use for the buttons. Read "About me" page linked at the top. Sorry my mistake. I thought because you often spoke about Russian keyboard layouts etc you might be in Russia. Hi DarkDuck, interesting review. May I just ask what desktop environment the Zorin OS 6 Core is using? Based on what I read, is it XFCE? Because you compared it to your Xubuntu so I just thought that. In your Zorin OS 6 Lite post, you explicitly mentioned it was using LXDE. I hope you can answer this as I am thinking of giving Zorin a spin, just can't decide yet if Lite or Core. Zorin OS uses its own Zorin Desktop, based on GNOME 3 Fallback mode. More about this - in Artyom Zorin's interview. Have you found out the solution for the issue with "show desktop"? Hi, all the systems you've mentioned are Ubuntu-based. It means you're talking about different flavours of icecream from the same manufacturer. I have only installed Xubuntu on my laptop, and I am happily using it from time to time. I have tried Pinguy, but that was an old version though. I don't know how it developed since then. Unfortunately, I have not investigated the "Show Desktop" issue any further. You may wish to ask on their forum. Simple solution for "Show Desktop"...Right click the task bar>Dock Preferences>Applets>Categories>Utility>Show Desktop. Double click the applet and it will be added to the "Active Applets" bar at the bottom of the settings window, drag it to wherever you want it in the dock. I've been running Linux now for 8 years and have distro-hopped like everyone else. I've been running Zorin now for about 2 weeks and I have to admit I am very pleased with it. Quick boot, very fast response time, everything works out of the box including all codecs, comes with a nice selection of packages without being bloated. Not all the choices are my particular favorites but that is easily fixed through the vast offerings from the Ubuntu repositories. Virtualbox runs like a dream. Configured all of my hardware no problem (although I'm not running wireless). I'd recommend giving it a spin whether you're a newbie or a seasoned user. You don't have to tell your Slackware buddies! And I am sure you'll be happy with Zorin in the future too! Hey Jesse, I've just been testing your respin and it's very cool. Had a problem with not being able to do system updates but it's probably a source issue that I need to figure out. One other thing - I was able to change the account password but when I try to change the account name Metacity crashes and I have to kill the process. Apart from that, great job! Nice review. I primarily run zorin OS since Zorin 5 as well as Pinguy and Archbang. I have a multi-boot system of Zorin, Sabayon, Pinguy, Windows 7 (I lasted booted into windows 7 7 months ago to see if it still worked), and Salix. Salix replaced Archbang due to Archlinux upstream issues with kernel panics. Once a new Archbang or Bridgelinux ISO gets launched, I might switch back to Archbang over Salix. Zorin tremendously impressed me. Very polished product indeed. Not as customizable as Archbang or Pinguy OS though. Pinguy OS still a masterpiece. My issue with Zorin is that after I install another DE, the Zorin Desktop switcher does not allow me to have XFCE desktop how I want it. The xfce panels get overlapped with some dark zorin custom panels. Minus this complaint, Zorin simply rocks. There is nothing much in Zorin 6, except what's in Ubuntu 12.04 and the Zorin Look Changer. The Zorin Look Changer is nothing much too, as Win 7 is Gnome Classic+Awn+Gnomenu, and XP look is the same Gnome Classic+Awn+Lancelot menu. The Gnome 2 is Gnome-Classic. Zorin Desktop is Gnome Classic of Gnome 3. If you have your Live iso with you, boot it in and go look in the /usr/share/xsessions and what do you see there? Or just install cairo dock and see. You'd find Unity and Gnome and all. Nothing much had been done to Ubuntu 12.04, except adding Zorin Look Changer and few apps. Even that annoying 'your language pack is not complete' all the time. That happens, when we don't install language packs with our Ubuntu installation. And that was remastered. Could you change the Awn panel theme or applet change? Your freedom is taken away by Zorin 6, not like in the Linux world. I appreciate that not everybody like every distribution. If you don't like Zorin, simply don't use it. It's not for you. It is for those people who only saw Windows before, and wast to try something from the Linux pie. You have written a long review without really reviewing the distro, Dark Duck. Before you log in, check the Unity Greeter. You'd notice that there are 4 choices. Gnome Classic, fallback Zorin Os and fallback. And Zorin is offering Gnome2 in the look-changer. In the Ultimate, the paid version he is offering MacOS and Unity look. The most funny thing is that the Unity WM is right there! The Awn Dock, which is a 3D dock, is blocked, so no one can even autohide it. The forum Administrator says, don't ever install Gnome Tweak Tool. Did you know why? When you install the Tweak tool, Gnome shell is pulled out and you have 2 modern WMs. As your Awn dock doesn't respond to any changes, you reinstall Awn, and then what you see? Awn with effects, and Unity! So much for the paid Zorin Ultimate with pseudo MacOs and Unity looks. Now, who is being cheated? After sometime, the newcomers notice that this distro is unresponsive than Win 7. Even in Win 7 the users can autohide the panel, install docks, and do so many things. Not that I don't like Zorin, but I don't like cheating and it only hurts the Linux world with such scams. You have that iso, so install and check. Then tell us, would you write such a review? Don't tell me what to do. If you disagree with my take, then write your own article. If you want, send it to me, and I will publish. "The middle part of the panel is the taskbar. It has the Windows 7 style in the default Zorin OS 6 Core distribution, where each application only has the icon without any text beneath. You can easily "pin" applications directly from the panel. The right-click menu, apart from the "pin" function, has application-specific items, like in Ubuntu's Launcher." How about checking what is Awn dock? Have you noticed an applet called "expander?" Or "DockbarX - the Dockbar for Awn?" This not for Zorin OS 6, but for Awn! Pin the function? Any app can be pinned in Awn!!! Check the GnoMenu to see, whether you could change to other "menu-looks?" Are sure you'd publish my article about Zorin OS 6 core? Why not?! I'd explain to all, how the Awn dock can be freed, how to get Gnome and Unity from inside and how to use the Awn panel to get MacOs X look, without paying a cent to Zorin. Would you publish it?! Don't nag. Write and send! @Images tell more than the words, don't they? No, they don't. I asked you to write a post, don't post tons of images in the comments. Sorry, I stop this trolling. You either send me a sensible written text, or I delete all your future comments here. I run a school districts computer system and I have moved to Zorin 6 on my better machines and have Zorin 5.2 on most of the ones that can't run the graphics on 6. I installed Ubuntu 11.04 last year and caused great amounts of panic in the staff. They had been using XP on machines with 512meg ram and panicked because it was not Windows. The funny thing was I was able to up the ram to 1gig and with the Ubuntu the machines screamed in comparison, but it was not Windows! The most sensible complaint I received was that it did not "Look like Windows"!!!! I have been using Zorin 5.2 at home since it came out so I moved the stronger classroom machines to Zorin 6. I had them in place for summer school this year and the kids love it, I even got my first volunteer teacher to try it this year and I am working on that build as I write this. It has come to the point where I don't care what version of Linux they use, I will find the way to make it look comfortable for them, if it be Windows, so be it! Moving to Linux has saved the district so much money we are able to look at capital improvements to the entire system. I lost interest in the hard-cores that think it should look this-way-or-that, I can find the information out there somewhere to make it look or do what my staff and students need it to do. 'Nough said! hello i'm trying to configure a shared hdd in my zorin installation, but no way can you hel p me? Sorry, it is not clear whether you want to share the internal computer's HDD, or you want to mount an external share on another computer. Please explain. With latest version of Zorin based on LTS version of Ubuntu, and Ubuntu 12.10 being the worst release for many years, I would not bother to upgrade.